Hello! For this week's Fashion Over Fifty post I've got a new flowers and sequins tank to show you that I styled three different ways. I found this GORGEOUS tank at Express and immediately fell madly in love with it. It has two of my favorite things on it: flowers and sparkle; and I love the contrast of the colors against the black silk. 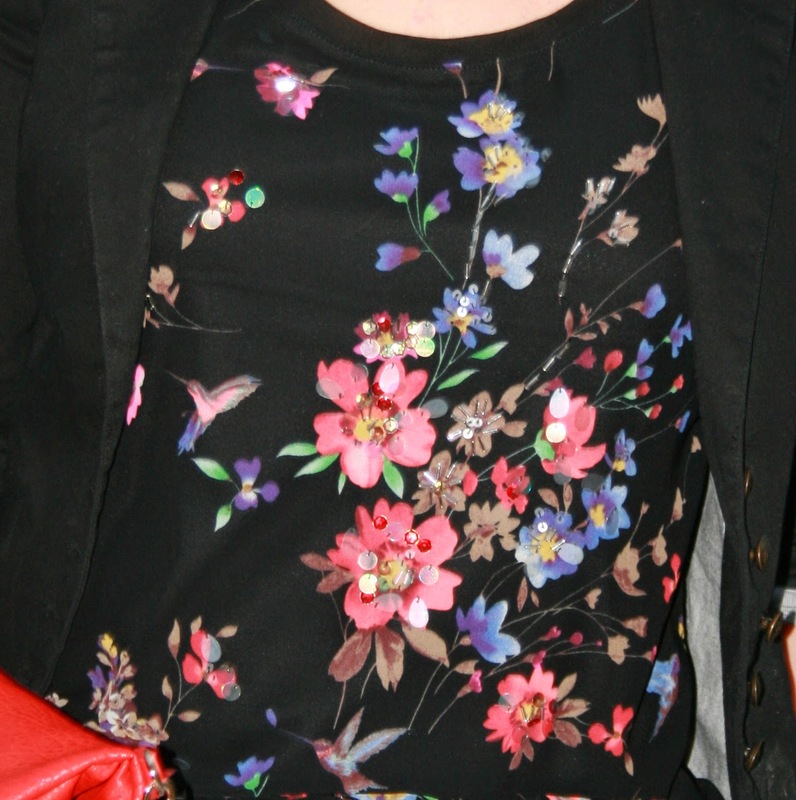 Because of the black background and the many different colors of flowers in the print, this shirt is so versatile. I can even see wearing it in the fall and winter months underneath a jacket or sweater, because it is primarily black. I styled it more casually for today's post; but with a pair of dress pants instead of jeans, it would be a perfect top for a formal occasion too. In my first photograph, I'm wearing the tank with a spring pink scarf I picked up at Forever 21. 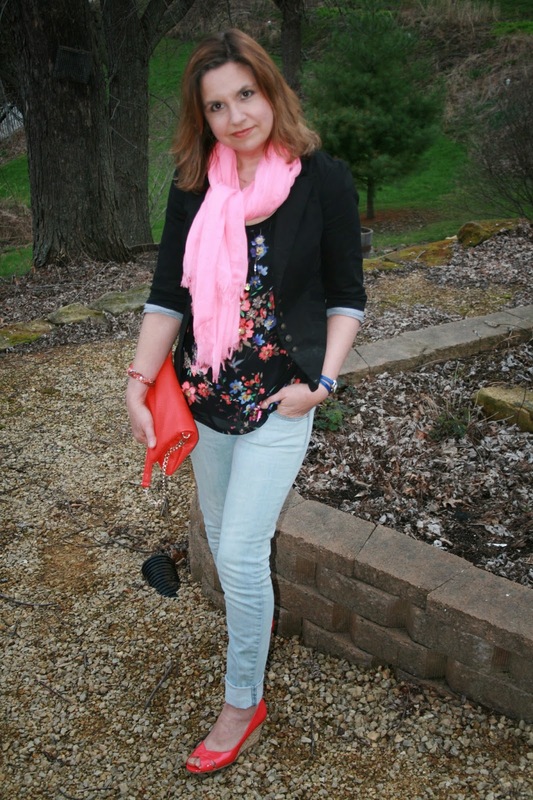 To brighten the look for spring, I chose my light denim skinny jeans by A.N.A. that I bought for $3.99 on clearance at the end of last year. 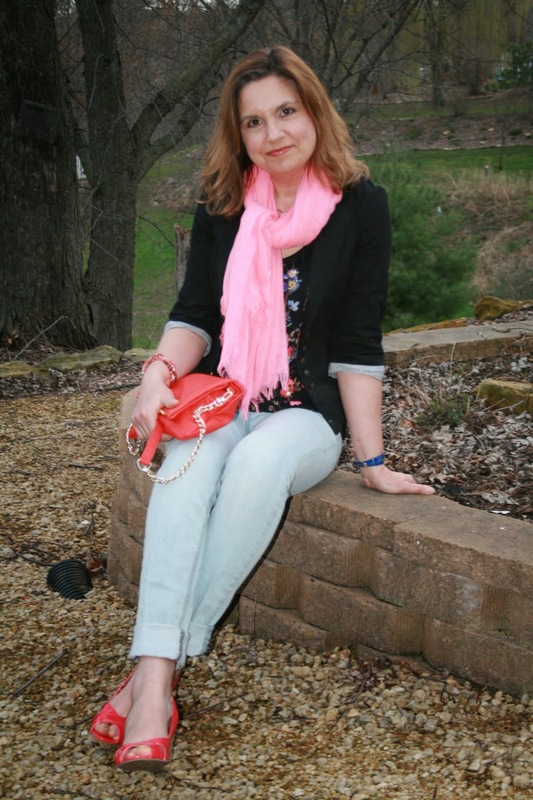 I'm using my same Tibetan Red Clutch from Express that I carried in last week's post. 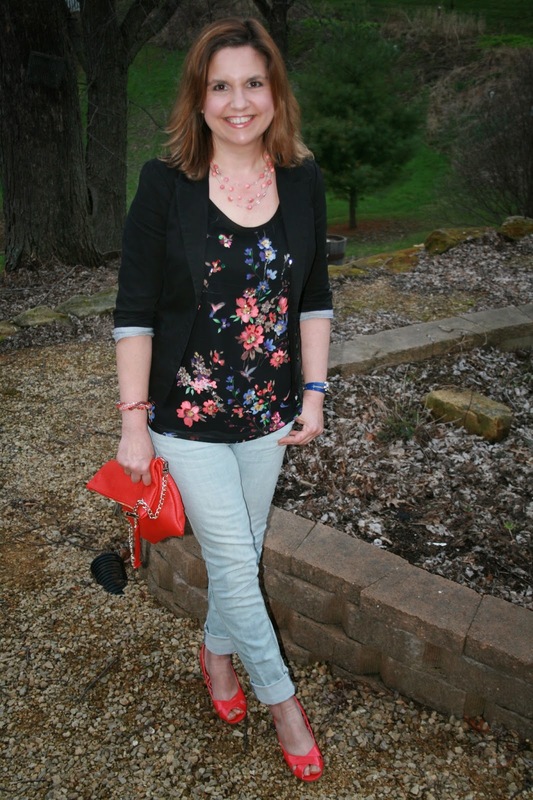 I wore a reddish orange beaded bracelet and a coral necklace for jewelry. For shoes, I've got my Payless comfort wedges on again. Although, the way my toes are squished, I'd hardly call them comfortable, but I can wear them for a short while. As the temperature increases throughout the day, I can then remove my scarf and more of my pretty floral sequined top will show. Here's a close up so that you can see all the pretty sequins. I wore this outfit to church this past Sunday and received so many compliments on this tank. I don't usually get a lot of compliments on my clothes, because people are probably use to seeing me dressed up, so I figure this tank must be pretty special! And finally, here is the third way I styled this tank. This time I wore it with a black scarf when I visited Graceland. It is a lot less bold than with the pink scarf. So which way do you like this outfit best? With the pink scarf, the black scarf, or just alone? I can't decide myself. I like them all. Great out fit Amy. Love the tank! I can't tell you either which way I like it better, it really looks amazing with pink and black scarf and also with no scarf at all. Love those wedgies and what a fab bargain on the jeans, looking great Amy!